A number of years ago, I decided to take a second class from master calligrapher and artist Thomas Ingmire*. I can count the number of instructors I have taken more than once on, well, two fingers. Thomas' description of what he wanted to do with this course intrigued me because it involved innovation in letterforms, and quite a bit of leeway. The jumping off point for the week long workshop involved studying an ancient (3rd cent.) 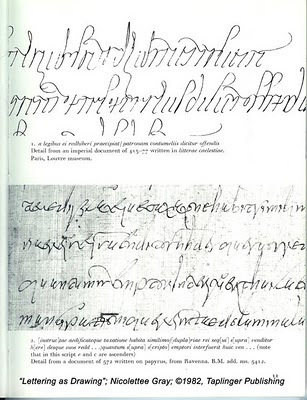 letterform called Roman Cursive, which to most modern readers is illegible. The samples below were taken from Nicolette Gray's work from 1971, "Lettering As Drawing". I decided to work this week in one of my journals, and began to write the adaptations of the letterforms in a water-based walnut ink... an ink that provides a rich and beautiful walnut hue but one that will also stain the page and leave a "ghost image" if I decided to wash it off. As calligraphers, we are taught to line out pages and write letterforms within the lines and boxes of text. Working with abstract calligraphy, however, allows one to break from these basic rules. My goal in these pages was not only to develop a letterform from the basis of the ancient Roman cursive, but also to begin to create textures and layering within the continuous page-to-page format of a book. The double page spread below shows my original practice underneath layers of paint and watery washes, and then written over again with new text. Taken even further, the concept now has an added element of the bold black letterforms, written in the space normally reserved for text in a book, but written abstractly and fairly illegibly (I say 'fairly' because these are actually written words). This particular page spread now has these text blocks written over about 5 layers of paint, washes and text. Coming into the next page spread, all boundaries are forgotten and now we are simply exploring the texture of the text and a sense of depth on the page, all the while continuing to develop that Roman Cursive personal variation..
A couple of folios later, I begin to explore the letters with a larger tool (hand carved black bamboo). In addition, I want to just begin writing without worrying if it all fits onto one page... in this case three double page spreads were utilized. Though I was writing a variety of texts during this process, the main text that became my theme was the quote from Emerson: "None of us will ever accomplish anything excellent or commanding except when he listens to this whisper which is heard by him alone". With yet another tool, a brass folded pen called the "moth pen" made by Jim Chin from Chicago, I began exploring more variations, using the same text, and variations of texture over the next three pages. Below is full strength Sumi ink. The same text as above is written with the same tool, but I have now used a diluted walnut ink and made that my background. I have then taken a randomly carved reed pen and used the Sumi to write a vertical text block in my own modified Roman Cursive. An finally, I liked writing those vertical columns, and so decided to use them as an exploration of size, weight, transparency and value in the final of the page spreads. These journals have continued to provide me with a format for experimentation and freedom. Many times I will go back and work on pages that I began months, or even years ago. Abstraction provides an even greater freedom to simply react to what is happening on the page before you and to work with your own sense of space and texture. 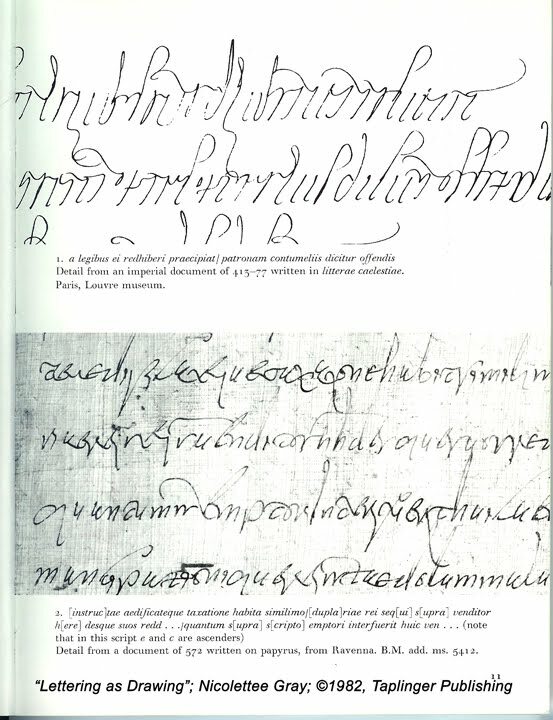 *More information on modern calligraphy can be found in Thomas Ingmire's book, Codici 1, which can be explored or ordered here. Someday I'm really going to start lettering in that big journal I bought. This is so inspiring! Oh, my goodness, Randall, these are just incredible. Thank you for going to the trouble of photographing and posting these for us--We, who love, love, love the beauty of the calligraphed letter and word but who will probably never come close to anything this beautiful. But the dream is still alive! Love the quote also--it inspires me for my work today on the heart ball canvas. THank you Cecelia, and Dianne... you saw this one up close! Thank you for that comment. Denise's work is beautiful; I was not familiar with her, nor had I seen that website before... much great work on which to feast one's eyes! I just love these pages...so free and spontaneous and mysterious. You have shown how beautiful and accessible abstract calligraphy can be. Yours was one of the few galleries I wanted to see during a recent visit to Santa Fe and I was so sorry to miss you. I look forward to anything new you post and hope all is well. I like what you present. I'll come back.